Action – Page 2 – Film. Politics. Pop Culture. The Bourne Legacy is not as urgent as the Ultimatum and Supremacy of the past, but it is a strong surge of paranoia and angst. The movie begins in a disorienting manner, like an old Bond film, with Jeremy Renner staked out in frosty mountains amongst the wolves. It’s not quite a homerun, a new re-amp that improves on the original, but such a feat cannot be expected. It takes an actor who was not quite a star and lifts him up to that level. And if in the long-run that’s all it accomplishes, fine, because Renner is an actor with true potential, though he recently said he will be taking a break from acting. No matter what they say about his size and physique, his energy is there–and if Tom Cruise can be short, so can Renner. The plot is basically an aftermath ‘gathering-of-wits’ from the Bourne case, featuring Pamela Anderson in trouble with the law after assisting Bourne’s escape. It used to be called treason, one of the CIA operatives says. There is no cameo from Matt Damon as one would assume, besides the CIA files containing his twenty-something profile. Next to Renner stars Rachel Weisz, a biochemical scientist working on the operatives ‘KEMS’, a programmable drug that enhances IQ and physique for Aaron Cross and other agents. Once he runs out, he is desperate for more–or else he will be incapable to do the hit em’ up tactics, and our movie would be over, or just plain unexciting. Edward Norton takes the place as CIA director–and he is my main criticism of the film, a man with no motivation besides duty, boring and meant only to give and direct orders. All other directors had some underlying reason behind there actions, whether out of malice or assisting the ‘enemy’. Maybe in the next film, since this one ends with the complete hope of a sequel to this sequel, a bit of a series overkill if you ask me. The movie never drags on and will definitely please the average action-junkie. It has a cast of versatile stars, and fails only to punctuate in it’s own ‘after-the-fact’ story premise: It’s the wagging tail of a long-gone series. Directed by Tony Gilroy, a writer for the earlier series, he showed promise for this movie after directing ‘Michael Clayton’, a very intelligent political thriller. And he does fulfill the promise, at least partially: The Bourne Legacy is an entertaining and adrenaline-fueled adventure. This Sundance punch is a gritty, neo-violent mess of a movie, featuring a cast of SWAT-team members dropping the guns and bringing out classic but hyper-realized hand-to-hand combat. It slides story to the side, deciding to instead focus primarily on the kinetic fight sequences and over-the-top kills. A SWAT team is raiding a drug lords building complex, an untouchable resort filled with only a handful of innocent residents; most are criminals or drug addicts. The objective is to silently rise to the top and remove the drug lord: Except, after being flanked by the maniacally violent, meth-head henchman, the officers realize that it’s not going to be that easy. And in fact probably even a challenge to stay alive. The voices in The Raid are synced with English voice dubbing. It worked fine for me, especially since there is such minimal dialogue, most of its running time filled with maximum violence. The only thing that I thought could have made a difference is having the voice-overs recorded by Japanese-English actors, instead of straight American voices. The scene transitions are well-done and there are some moments of sheer tension: A blade, cut through the wall that covers the covert officer, positioned directly onto his cheek. The next slash is in his head. The noirish atmosphere fits well with the dark mood of the tale. Residents are shown lighting and smoking foil-crinkled pieces sprinkled with crystal. There is one guardsmen in the building that is torn between loyalties, a fresh dynamic to insert into an otherwise straight-forward tale. Like the grind house movies of the 60s and Tarantino, this movie strives on imagining the most creatively possible deaths. Smashing a head into a splintered door, using peripheral objects as convenient stakes of death; It’s like a piranha movie with the piranhas replaced with sweaty, knife-bearing psychopaths. Chaos on each floor, and a heightening sense hopelessness, no end in sight. The movie is very impressive in its editing techniques. Dark-lit halls reveal a mob of gun-wielding henchman; and then pounding, vibrating music as the bullets soar through the air. The filmmakers make use of slow motion, and an insanely intense shootout brilliantly constructed with a shaky cam to match the chaos of it all. At times, though, it cuts to so many places that appear so similar to the last that it becomes hard to keep track of who’s who. With the characters being introduced very briefly at the beginning, the impressions aren’t very long-lasting, but the magnificently choreographed fight skills shine through and clear. It’s definitely not a movie for everyone, but such a thing doesn’t and shouldn’t exist: If you like skillfully designed action sequences and over-the-top violence, it’s safe to assume that you’ll thoroughly enjoy The Raid. Mark Wahlberg and Kate Beckinsale star in this flashily shot heist thriller with somewhat of a pulse, but yet in the end adds up to a genre exercise that doesn’t really exercise much at all, other than Wahlberg’s biceps. It’s character driven and has plenty of pans swooping over city-lit buildings with picturesque, faded yellow lights that would look like Michael Mann’s Instagram if he had one. There aren’t very many moments of grave suspense, and in fact most of the subplot conclusions are extremely predictable. Though it may be generic, one shouldn’t discredit the movies impressive qualities, especially its intriguingly grainy, darkly-colored photography. Battle Royale is the BR act in Japan, which consists of a mandatory lottery that selects a class of students to fight it out on an island, to the death. In this film, we see a class of rebellious ninth-grade students taken onto a bus, gassed, and then woken up, confused and bewildered like the viewer. Their past teacher, one who was cut and abused during his time teaching, shown in the first scenes, is now their commander in the BR act. They are all very shocked and the sense of rebellion still acute. They shout and demand answers. This is it. Their to be silenced, with a bag of random weapons and a chance in the course of three-days to kill all their classmates and remain alive and able to return home. But to what? Is what’s being asked by several characters. The film blends pulpy, bloody action with high-school drama in a sardonically funny, yet poignant way. Behind each person pointing a gun comes with conviction: You locked me in the bathroom, you stole my boyfriend, etc. High-school students are too misty with their priorities for violence, and the ‘teachers’ know this. The scenes are shown in an evocative manner alongside long-spanning landscapes and frightening noises. Shuya and Noriko band together as romances, like so many other devoted young lovers, or young fighters. The movie has stark similarities to America’s Hunger Games film and books raving, but this is an entirely different beast and genre. 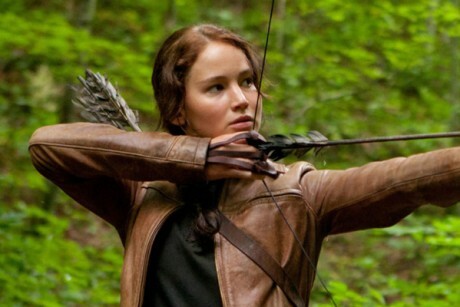 It is dark, atmospheric, and grotesque, while Hunger Games is fluffy, flush-faced and Hollywood-designed. Don’t make exceptions with your children on this one. Their are ironic moments that lift this film far above The Hunger Games. It isn’t first-person, but instead switches to different people and incites convictions from different points of view. The way it seams these together, even with sporadic use of flash-backs, makes it a masterpiece of film structure. When you look at movies in Hollywood consisting of twenty-plus people, you will see two or three people and become close to them, idealize them in fact, and the rest of the bunch won’t be introduced besides the act of being killed. Not here, though I don’t see entirely why we couldn’t spend a few minutes of exposition introducing the characters in their natural, school-desk existence. Battle Royale is a strong, highly cinematic and entertaining film for those who like Pulp action or High-school drama (think Carrie). This is a movie that deserves and is receiving hype, even with the subtitles that ignorantly turn people away. Quentin Tarantino packs a punch like usual with his Nazi slap-in-the-face, Inglourious Bastards, showing an organized, street-like Jewish rebellion: The bastards. A crew of Nazi killers who remove the German’s scalps for treasure, and wipe out whole scouting parties to the point of making a name for themselves amongst the Nazis. It’s well acted all around, and rightfully won Christoph Waltz an Oscar for his role as a cruel German officer, or ‘The Jew Hunter’ and features a very dense plot, with several story-lines weaving into one, like the Director did in one of his earlier films, ‘Pulp Fiction’. The movie is somewhat exploitative in the way it takes a terrible event in history and turns it into a showcase and excuse for being terribly violent; yet, its rewarding in more ways than this, and Jewish folk are a bit to modest to make a movie so audacious: Roman Polanski making this film would be much different than Tarantino making it, and people no doubt can make the distinction. Lt. Aldo Rain (Brad Pitt), is leading a team of Jew-recruits into the heart of Germany; their scenes are the most exciting, like a scene taking place at a bar where a member of the crew is trying to fit in amongst a table of hearty German officers. The result is not a gentle tip of the hat and a salutation, the bastards send bullets in all possible directions. This leaves a famous German actress, alive but wounded in the leg, for their taking: they use her as sabotage to access a party for the Fuhrer, later in the film. A young Jewish girl, Bridget Von Hammersmark, who escaped Lieutenant Hans earlier in the film, becomes a theater owner at a fairly young age, having inherited it, and becomes the attraction of a young and famous German soldier, who, as a a hiding Jew, she internally could never love. He’s more than just a soldier, too: he is a star in a new German film where he solely sits at the top of a clock-tower and shoots down Jews below. The fuhrer loves it, but Bridget comes up with a plan to show the Germans their cruelty, a down-pouring of beautiful revenge: Let the theater on fire. And with the easily combustible film of that era, it would not be difficult for it to actually happen. The film is a fantastic genre-blend of action, violence, and alternate history, featuring typically memorable characters from Tarantino, some hypnotic scenes, and an all around entertaining flick: Inglourious Bastards is far from a disappointment from Tarantino.